I’ve been quiet recently because I’ve been preparing to give a talk to the Atlanta Perl Mongers. In the meantime, though, I produced this graph as an example of the charting software I’m going to talk about. 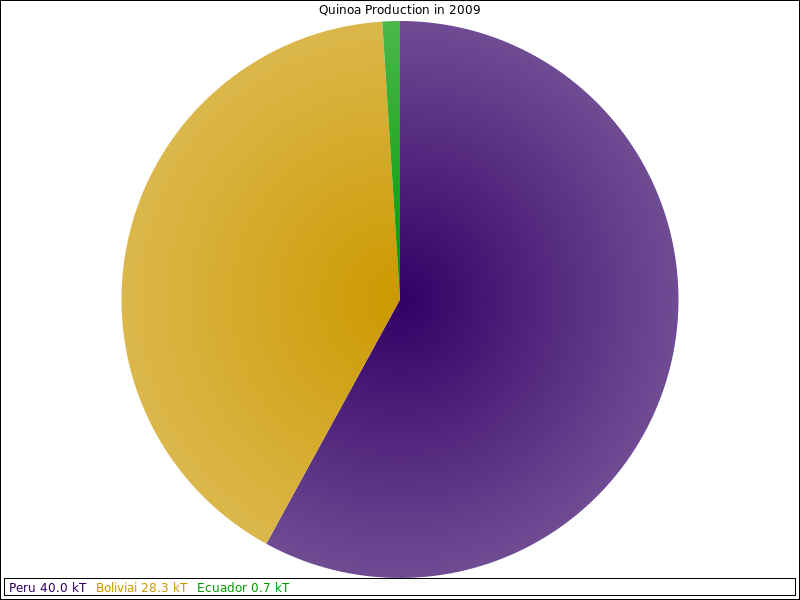 Worldwide quinoa production, from the Wikipedia article on quinoa. Quinoa production is largely dominated by two producers, Bolivia and Peru, with a third adding about 1% of the commercial market. My understanding is that they’ve tried to grow it in the States in Colorado and Minnesota. Minnesota, lacking the co0l mountain climate of Colorado, grows large healthy plants that don’t seed. Other sources note the production of commercial quantities in Colorado since the 1980s. For example, one American farm growing quinoa is White Mountain Farm, in Colorado. At the same time, prices have risen in Bolivia to the point the poor can no longer afford quinoa. It can be scary what a bachelor (or in my case, a husband in a family with a working wife) can do if they master a few techniques. I don’t cook many different foods, but quinoa is very easy to prepare and tastes good even if it’s plain. Quinoa salads are one popular way to prepare foods with this pseudocereal, but I’ve been fond of a recipe.. no, more a way of cooking that the blogger Feed Yourself demonstrated and I like to use. Although Feed Yourself called it a pilaf, it’s really more of a stir-fry. This time the point was to make something good tasting out of vegetables I had to cook or let spoil. Oh yes, and also leave enough behind to do lunch the next day. 1/3 large red onion, diced. 2 cloves of garlic, thin sliced. 2 sprigs each, oregano and thyme. Get a 2 quart saucepan and add quinoa and the cup of water (and some soy if you want), cover, heat until simmering, ca 15 minutes, when the water is gone. Set the quinoa aside. Prep the veggies you need. To note, the combination of onion, carrots, and celery is common enough it has its own name. And in my case, the onion had sprouted, the celery had bad spots, the peppers were showing their age, and the oregano and thyme were almost dry (but smelled so good it was a shame not to use them). I cut the bad pieces out and threw them away. Put one tablespoon of oil in the frying pan, let it heat on high (I like a drop of water in the pan, to tell me when the pan is hot enough to use. The drop will boil off and that’s your sign). Add vegetables, and turn the heat down to medium. Stir until the onions just begin to change color, about 5-7 minutes. Add quinoa, and the leaves of the spices. Stir for a minute or two, so the quinoa is nice and warm. Pour into a bowl, season to taste, and serve. Two servings of a quinoa stir fry. Notes: on the blog Pink Spots, there is a very nice looking pineapple cashew quinoa stir-fry. The blogger Au Naturel has a recipe she calls an Asian quinoa stir-fry. The blogger Fat Free Vegan has a nice recipe she calls vegetable fried quinoa. The blogger Adventurous Eater likes adding a bit of egg to her quinoa stir-fry. The day started out mostly as an idle web search. I searched on the phrase ‘heirloom beans’ and found this book (now on order). In the process of poking around links related to that book, I ran into a discussion of beluga lentils. And after finding this very enjoyable article discussing ways to cook lentils, I just had to stop by the closest Whole Foods and see what they had. And yes, Whole Foods is very much out of the way and not a typical place for me to shop, but when looking for exotic goods, you go where you have to. Inexpensive quinoa and farro can be found at Whole Foods. Afterwards I bought odds and ends for my wife and left. Trader Joe’s is on the way home, I needed something to eat and I like shopping Trader Joe’s. I was kind of wanting their baklava collection, and of course, once I was there, I couldn’t find it. I did find beluga lentils. They were cooked, so I wasn’t interested (I want dried legumes). I found some nice baby broccoli, and there was a well priced cut of steak (under $5). On the way out, the clerk found the baklava for me. I had just walked past it. A price comparison: 1 lb box of Trader Joe’s quinoa is 3.99. The 1 pound bag of ‘365’ brand Whole Foods quinoa was $2.99. Third stop was Publix, to check out what N. K. Hurst products they had, get a feel for prices, etc. N. K. Hurst is an American company located in Indianapolis that sells bean based soups. They have recently started a blog, which posts recipes of their products (and potential products). It is currently undervisited, and if you like the “HamBeens” line of soups, drop by their site and give them a try. Hurst has a 15 bean soup, which has not gone unnoticed in the blogosphere. They sell other soups as well – lentil and split pea based, northern bean based, etc. In comparison to the store brands (when they existed — the 15 bean soup was unique at my Publix), the Hurst products were priced anywhere from 50 cents to 80 cents more. The value added is in the recipes on the back, and a spice pack included in the product itself. It’s just my feeling mind you, but if the package had the url of the new blog on it, it might do their customers even more good. The blog has pictures of the things that can be done with Hurst beans, more so than just boiling them and tossing in the flavor packet. Take home? It’s nice to see an established brick and mortar American company try new and innovative ways to reach their customers. Kudos to N. K. Hurst. In terms of availability, I wish their combination lentil product were for sale at Publix. I didn’t see it there. Back to food. Dinner was going to be pan seared steak, along with snow peas and some version of the baby broccoli. I wanted a fast, simple way to prepare the broccoli and I found this recipe. In My Box’s use of just half a cup of water to ‘steam’ the broccoli, combined with ~ 6 cloves of garlic and 2 tsp soy, looked really good. I tried it. I only had 3 cloves of garlic and I guessed on the amount of soy sauce but it still came out nicely. Once done, my daughter insisted on having some. ca 2:30pm — I have a pot of black beans simmering on the stove, I have done some shopping and have the stuff for pico de gallo (substituting jalapenos for serranos this time), and I have hard red wheat and red quinoa from Mother Nature’s Market soaking on the kitchen table. Soaking: hard wheat on the left, red quinoa on the right. I’m thinking along three lines: black beans and rice as the first dish, some pico de gallo, and then a mung bean soup, with some wheat and quinoa added to provide the grain component of the soup. Of these three, it’s with the black beans and rice that I’m winging it the most. Thankfully WordPress has a common tag named rice and beans. I threw in some salt, marjoram, a bay leaf and a few cubes of ham after about an hour of simmering, just to see what it would do. It has improved the smell of the pot quite a bit. I want the beans soft though, and different recipes I’ve perused are giving different times to simmer. This recipe suggests an hour and a half (but no salt) and this one suggests (with salt) perhaps three hours. I’ll note the cubes of ham seem to have disappeared by now, melted into the broth of the beans. This recipe looks fantastic, but I’d have to use the same stuff I want to use to make pico. ca 3:45pm — The pico de gallo is now marinating in the refrigerator. The last batch really didn’t hit its peak of flavor until 2 days after mixing. Today, the tomatoes were huge, the green onion bunch was huge, and the japalenos were huge, so 3 tomatoes, 1 japaleno, 1/2 a yellow onion and a bit more cilantro this time. It’s amazing how much easier it is to mince cilantro when you have an idea of the right tools (this tool, or perhaps that tool) to use. The beans are whole and soft and on low heat.. I’m trying to reduce the liquid the beans are in. In a lot of recipes I’ve seen so far, they save the bean liquor and use it to cook at other stages, but if we’re sticking to the principles of Louisiana red beans and rice, we’ll just mix beans and rice and some of the liquor as needed. Flavor should evolve in the dish if we just eat some today and save the rest in the fridge. ca 4:45pm – black beans and rice are done. The final result: a bowl of black beans and rice. I cooked the rice (1 cup) by first sauteeing it with a bit with celery ( 1 stick) , onion (1/2 smaller yellow onion) , garlic (2 cloves), and a handful of diced ham. I added water (2 cups) and let it simmer a bit (15 to 20 minutes). I forgot the lid and there were some losses, so I had to add more water as I cooked. The end product was good and soft, but a little sticky. The beans were well nigh perfect and the mixture quite edible. My family came home just as I finished. My daughter liked it, my wife decided it was good, but could use some spices. I need to get my wife to teach me how to use the rice cooker. ca 6:45pm — The black beans and rice ended up as half our dinner (smoked sausage being the other half). A single serving of bean and rice is all that is left. And of course, my daughter was right. It’s what happens, I guess, when you soak quinoa almost 24 hours. I guess 4 hours is enough. In any event, I had to precook the wheat for about half an hour, because I anticipated about 25 minutes of cooking for the mung beans, and wheat needs 45-60 minutes of cooking. I cut up a typical assortment of veggies.. 3 celery stalks, carrot sticks equivalent to a couple carrots, 1 yellow onion, 3 cloves of garlic, some remaining mini-pimentos, and the japaleno I didn’t put into the pico de gallo. I cooked the veggies in the pot in olive oil for 5-6 minutes and then added the wheat berries. Afterwards, I added mung beans and covered with about half an inch of water. In the pan I was cooking the wheat in, I added a quart of water and heated it while I cooked the rest (so I could add hot water as needed). 10 minutes after I started with the beans, I added the red quinoa, sprouts and all. marjoram, thyme, salt, salt substitute, red pepper to taste. 12 drops of a habanero-mango hot sauce. It’s a good tasting soup, and it’s going to be lunch for the next 3-4 days at work. The blogger Feed Yourself has a recipe for a red-white quinoa pilaf that I’ve been eyeing for a while now. I had a piece of steak at home but no sides, so I figured this wouldn’t be bad. I could seal up any extra in a microwave container and take it to work. I was confident enough in my ability to cook quinoa and quickly, and I’ve cooked veggies similar to this in oil before. I just had to combine these steps in a couple different ways. Course, I’ve never made any pilaf ever, much less a quinoa pilaf. What the heck, worth a try. I was too hungry to worry with cleaning up my red quinoa, so what I made was purely a white quinoa base. I had never taken quinoa so low in water that it wasn’t at least oatmeal-like in texture, so I spent a lot of time watching that bowl with a “is it done yet?” eye. I should not have worried so much.. it dried up just fine. I took it off the heat and fluffed it. I cut up too much parsley, and my vegetables are hardly chopped fine. I tossed in some cilantro too, about a half handful – I’m a big pico de gallo nut and I’d probably tossed in pico if I could have found some. I misplaced my measuring spoons so had to guess with my spices using a baby spoon, but it all seemed to be pretty invulnerable to any fumbles on my part. The pilaf is tasty and simple to make. I took about half of it to eat with my dinner, a suprisingly good piece of leftover steak, along with some Jumex guava nectar I snagged while buying soft drinks for my wife. The rest of it I put in a microwave container. It’s going to become lunch, or perhaps a dinner side sometime. The cleanup was a bit messier than I was used to. Soups tend to clean themselves but green bits of parsley were everywhere. The pan I cooked the quinoa in also had quinoa stuck here and there, but cleaning out a quinoa pot has a lot of the same pleasure I recall from cleaning up the cake mix out of bowls in my youth. Check out Feed Yourself’s recipe. Definitely recommended. I finally got my hands on red lentils today, and the first thing I did was whip up a batch of my ever mutating lentil soup recipe. I decided I’d add bulgur into this one as well, but not a lot of it (ca 2 oz). And I increased the proportion of garam masala, coriander and cumin by 50%. Got the soup going, waited a bit, tossed in the quinoa and bulgur, added spices, added water, let it get to a simmer again and took stock of what I made. Good looking and tasting soup, but the lentils have fallen apart. It’s a good tasting soup, but the red lentils, purchased split, are dissolved into the broth, and because of my liberal use of Indian style spices, even the color of the soup has reverted back to a greenish hue. It tastes really good, but I do like actually seeing my lentils after I’m done. On a totally different front, found two new food links that I really like. The first is a recipe where lentil soup is topped with cilantro, and the second is a red quinoa-white quinoa pilaf. Both look really delicious.